Yardmaster House, large 3 bedroom home, sleeps 8. This three bedroom holiday home is available for rental from Island Accommodation for you next holiday on Great Barrier Island. 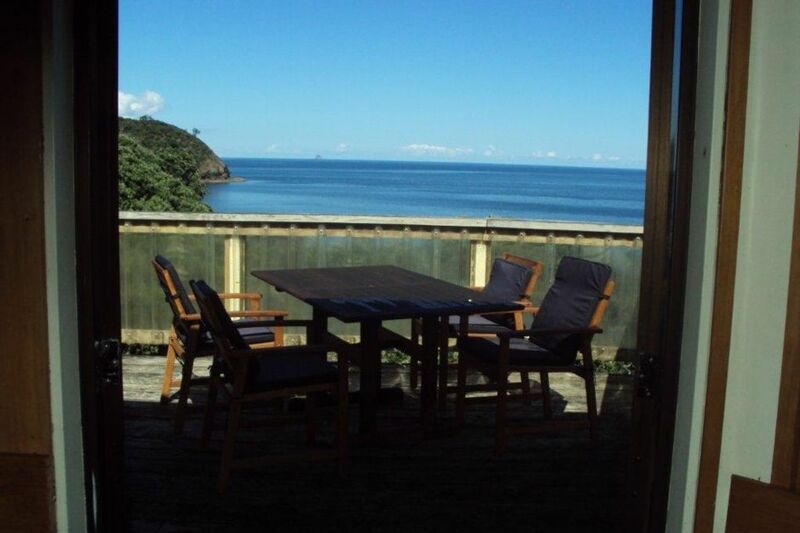 It is nestled amongst mature pohutukawa and has spectacular views of Schooner Bay. Enjoy your holiday with great fishing, snorkeling and kayaking. The house has a large deck upstairs and a barbeque and garden area downstairs. The lounge and kitchen can be divided off with a sliding door.12 volt power only for lights and Cd player. Home was nicely put together, in a private location but close to the amenities of Tryphena. The balcony view was beautiful and a great spot for star gazing! A beautiful isolated comfortable well equipped basic house with character amazing sea and bush views birdsong glowing sunsets and playful dolphins to watch. The house at Schooner Bay was a good base for five women friends in their 70s to explore magical Great Barrier Island . We all hope one day to return. The batch is very rustic. Such a unique property and the perfect location for exploring the island and having some switch off time. Fantastic place to stay. Nice and private, clean and tidy. The beds are a bit worn out. Wonderful place to stay will definitely be back.